"Every 5 years, the tribes of the Sahara race their finest horses. The race is a great test of stamina for both horse and rider. To the victor go the best horses from the losing tribes, bringing prestige, wealth and power.Strongest and fastest of them all is The Black Stallion, who means more than anything to young Alec Ramsay." I imagine it would be a tough task to attempt to match the splendor of the original The Black Stallion (1979), which featured the amazing work of director Carroll Ballard and cinematographer Caleb Deschanel. Trying to recapture the magic of that film with this lifeless sequel doesn't really tarnish the original, but it does slightly taint the memory a bit.The first hurdle that director Robert Dalva has to clear is setting the film one year after the first one, when in reality it was filmed over four years later. Kelly Reno, who was frail and tiny when we first saw him as Alec, here has sprouted into a tall gangly teen who barely resembles his earlier self. I can forgive the advent of teenage growth if the subsequent story had been partially as entertaining as it's predecessor, but that's just not the case here. The original Berber owners of the title horse, whom they call Shetan, have arrived in America to steal him back, and intend to return to the Sahara to take part in a grueling tribal race. Plucky Alec stows away on a plane to Casablanca, and then stumbles his way across the Sahara on his way to the mysterious Wadi Draa. Along the way he is befriended, more or less, by Raj (Vincent Spano), who serves as Alec's guide and mentor as he tries to locate his hijacked horse. It takes nearly an hour before the boy is reunited with his equine pal, and the predictable race finale plays with a minimum of excitement or energy.Trying to add treacherous turbaned villains, such as the leering Kurr (Allen Goorwitz), does little but turn The Black Stallion Returns into what amounts to a stock yarn that is desperately low on adventure. It had to be an uphill battle to even try to recreate what Ballard and Deschanel laid down years earlier, and had the first film not been so uniquely grand then this snoozer would probably have never been made in the first place.Dull. Image Transfer Review: MGM offers a pair of respectable transfers (1.85:1 anamorphic widescreen and a 1:33:1 full-frame on the flipside), though it seems a bit like overkill. The daylight scenes feature a palette that is represented by rich, natural colors, and the abundant desert sequences look very clean, with adequate detail. Black levels are rather muddy, and some of the night sequences suffer from a lack of shadow depth. No noticeable source print flaws or excessive artifacts.All in all, very ordinary. Audio Transfer Review: The 5.1 English surround track provided here is less robust than the 2.0 surround track offered on The Black Stallion, and confines most of the action across the front channels. Dialogue is crisp and adequately mixed, with a fair amount of directional imaging spanning the fronts, as well. It is decidedly unspectacular, and could have benefited from more discrete use of the rear channels to enhance the overall experience. French 2.0 surround and Spanish mono tracks are also included. Extras Review: A poor quality theatrical trailer and 16 chapters are the extent of the supplementals. A weak and forgettable sequel to a magnificent original. 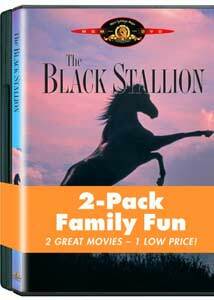 There is none of the charm and beauty from the first film, and this is nothing more than a familiar series of events that is ultimately lifeless.MGM has repackaged The Black Stallion Returns in a low-priced 2-pack, along with the far superior The Black Stallion. It's worth it just for the original, but this sequel is pointless.